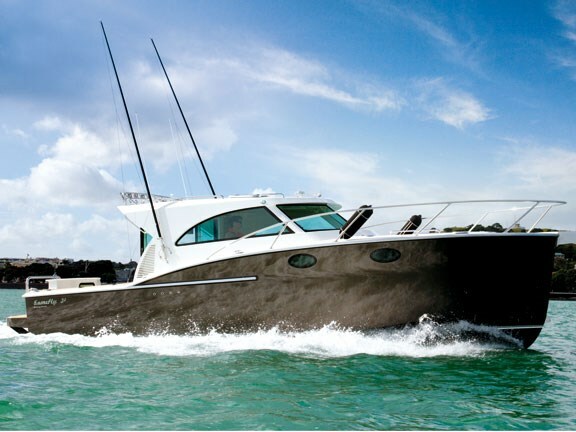 Acclaimed Napier-based custom aluminium boat builder Dickey Boats is the brainchild of husband and wife team Jason and Tristin Dickey. The Dickey's share a long love affair with the ocean and are as passionate about their boats as they are the people that use them. 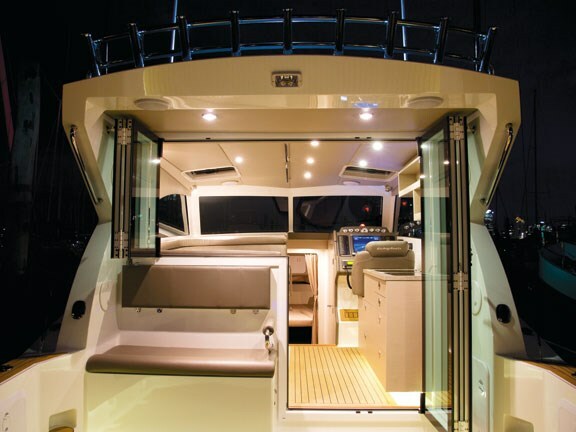 An experienced commercial skipper, boat builder and marine engineer, Jason's practical experience shows through in the high-performance hull forms, refined layouts and clever innovations that have earned the company a great deal of respect from boating media and judges alike. Increased demand for their unique designs has prompted a recent move to a purpose built 600m2 facility, with room up its sleeve for further expansion when it's required. Our test boat, Tribal, was one of eight Dickey boats in construction during the pre-Christmas rush. 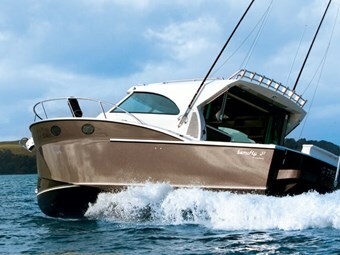 The name Semifly comes from the raised helm position that forms a low-profile flying bridge of sorts. As with most things deigned by Dickey, there's a calculated reason for this: "We keep the centre of gravity low by keeping the floors low; everyone is on the same level. We don't believe in flying bridges because it puts the helmsman in the most uncomfortable seat on the boat and removed from all of the action. All of our boats have this flow so that the skipper is always part of what's going on in the cockpit," says Jason. Dennis Harjamaa was engaged to draw the plans, and when it came to designing the first Semifly, the team started from scratch, with the goal of designing a completely new boat that is the full package. There were to be no compromises made on any design details and it had to look and feel right as well. Jason admits that this approach did present some difficulties: "Every little thing we've done is to improve the ride and sea handling without sacrificing practicality, fuel efficiency and performance. It was extremely challenging to start with a blank sheet of paper and work out how we were going to achieve these things," he says. The painstaking design process was underway for two years before the first Semifly began to take shape on the workshop floor, and it took another year of construction before it was finally christened. Ask Jason how the company constructs its masterpieces and he'll tell you, "we don't build boats, we build ships. Instead of growing through small boat manufacturing, we've taken big boat manufacturing and brought it back down. That goes all the way through our range, basically, they're all built the same as ships with full interlocking ring frames, stringers, girders and longitudinals right through. This allows us to get the very complicated hull forms in the bow, while giving the boat immense strength and the opportunity to fully utilise the space within." All components are designed in-house and in conjunction with the owner. Each individual piece of the puzzle is made before construction begins. Jason walked me through the initial construction process to give me an idea of what they're up against at the Dickey HQ: "Everything is computer cut and laser levelled so that each section of the boat meets a one millimetre tolerance. They are absolutely perfectly balanced 100 percent, and I can guarantee it. It's not about cutting corners; it's about doing it right," he remarks. Tribal was enroute to her new owner when I met up with Jason and his dad, Graeme Dickey, in Auckland. I was lucky enough to have a first-hand look around before its delivery voyage north for the handover in Tutukaka. I had already been struck by the stunning metallic bronze and white paint job from the dock, and stepping on board only further inspired a sense of awe at how beautifully finished it was there too. 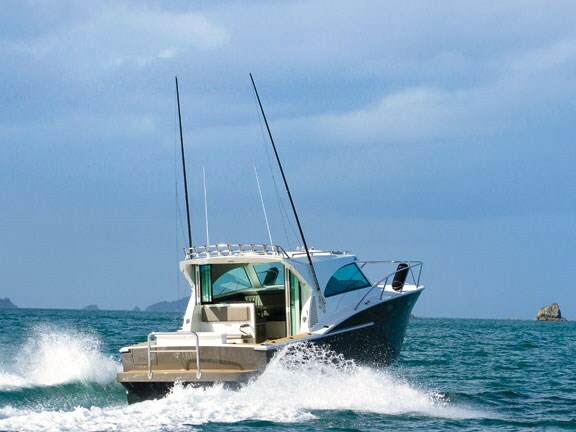 Innovation isn't something that's taken lightly at Dickey Boats and the cockpit is somewhat of a game fisherman's dream that boasts many clever features. The bait board lids split and pivot open giving you unrestricted access to the inbuilt live-bait tank, tuna tube and rubbish bin below. As expected, game poles adorn the sides, while foldaway cleats ensure clean lines and, more importantly, a snag-free environment. The tackle boxes are neatly hidden behind plastic hatches in the gunwales and each rod holder is precisely positioned to entice a strike. Two further rod holders are cleverly located in the rear pillars for hassle-free lure changes – just another insightful design touch to show you that Dickey have really done their homework. Overhead, the rocket launcher is a stretch to reach but it does include tie down points to secure the gear in rough weather. A rear facing seat provides a comfortable position to watch the lures or the sunset with a cold one in hand. "Tek-dek" provides a low maintenance, easy-clean alternative to real teak while retaining the visual appeal. The cockpit sole is lowered for easier landing of a trophy winner and Jason's time spent as chief engineer on super yachts is clearly evident, with excellent all-round access to the engine via the hydraulically lifted cockpit floor. The entire upper level can become an almost seamless entertainment area, simply by opening the glass bi-fold door and window. A chilly bin is neatly tucked beneath the rear seat and when the seat is not in use a Corian shelf lifts up to provide a handy servery for drinks and nibbles. 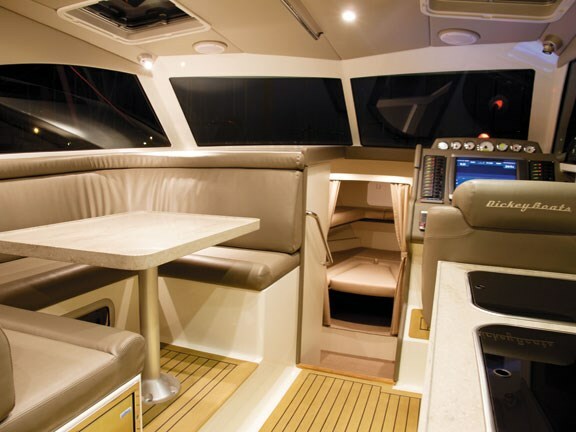 Stepping forward into the saloon, you're greeted by a comfortable couch, accessible fridge and Corian pedestal dining table to port, while the functional and modern galley with a gas cooker and sink lies to starboard. The Tek-dek floor is continued throughout to provide further flow between the cockpit and saloon, and facilitate the easy clean-up of those inevitable spills. A short flight of stairs leads below to the comfortable and luxurious accommodation level. The cosy master cabin is concealed neatly beneath the saloon floor with a further double and two single berths located in the forward cabin. A large set of drawers occupies the common area to port with a private and spacious bathroom to starboard. After our whirlwind photo shoot and race against the impending grey clouds, I eagerly took the wheel and felt instantly at home. 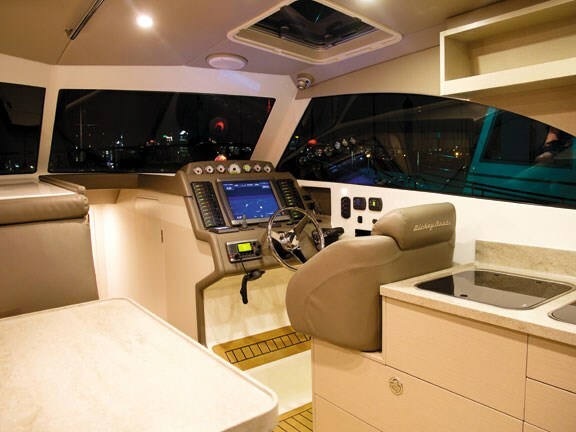 The helm station is exceptionally comfortable and functional, with the view through the large glass windows almost encouraging you to engage full throttle and power over the horizon. And with the cruising fuel economy from the quiet Volvo hovering around two litres per nautical mile, and with 640 litres of diesel under the floor, this is quite an enticing possibility! We had a 20-knot westerly on the nose at times but the angle of attack was inconsequential: the plumb bow sliced effortlessly through a metre of messy, confused chop at WOT (33 knots). The boat's level attitude and smart hull design also meant it held the plane at 12 knots, a feature which should see it comfortably handle shoddier conditions. Once we got back to the marina, Jason guided it gracefully into the berth using the joystick controlled bow thruster.